Overnight Wednesday Night: Mix changes back to snow showers, temperatures drop back below freezing for ice. Thursday: Sunny and cool. Highs near 30. Wind chill around 20. A winter storm will impact New England on Wednesday, bringing up to a foot of snow across the higher terrains of central and northern New England. Six to 9 inches of snow are expected from Worcester to Manchester, New Hampshire, while a mix of rain, sleet and freezing rain will reduce snow totals from Worcester to Boston, where 2 to 4 inches will fall. 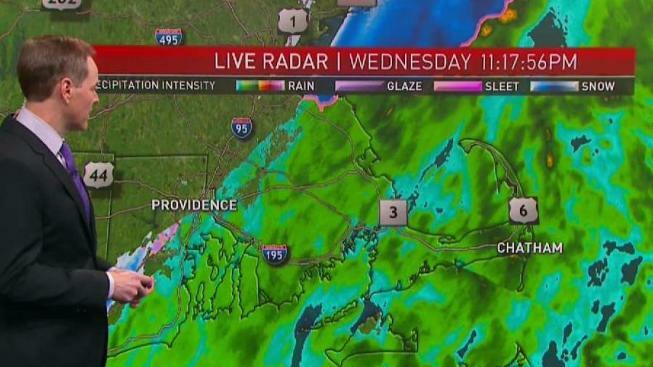 Toward Quincy to Cape Cod and the Islands, a coating to 2 inches is expected. Warm air aloft will increase throughout the day as the low pressure system moves into the region. Snow to the north and a mix of precipitation will continue throughout the afternoon into the evening. Areas south of the low pressure track will reach into the 40s and areas north of the low pressure track will struggle to get much over freezing. The evening commute will be impacted by this storm, as precipitation rates reach their highest around this time, with mostly rain across the Boston/Interstate 95 corridor, mixed precipitation across central and western Massachusetts and mostly snow from southern New Hampshire and Vermont to the Canadian border. Precipitation shuts off after 9 p.m. for most of the region, as the storm system shifts northeast and winds flip from the northwest. Low temperatures will drop into the mid teens to mid 20s. An Arctic cold front will be moving offshore Thursday morning, with drier and colder air continuing to spill in across New England. This will result in the possibility of a flash freeze for any untreated roadways. High temperatures will struggle to get out of the low 30s across the south and low 20s across the north. An area of high pressure will nose into our area on Friday, bringing partly sunny skies and continued cold. A wave of low pressure may bring a couple inches of new snow across western areas during the late afternoon to evening. Highs moderate ever so slightly into the mid 30s across the south and the upper 20s across the North Country. Looking ahead to the weekend, a widespread rainfall moves in on Saturday as a sub-tropical high pressure strengthens offshore. There may be some icing issues across higher elevations due to lingering cold air close to the surface and warmer temperatures aloft in the atmosphere.